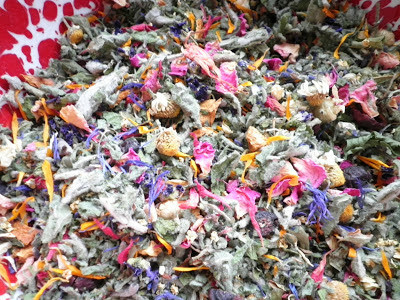 I've talked about how in my very early days of learning to work with herbs, I started a gallon jar containing pinches and handfuls of all the herb tea-worthy plants and flowers that I'd gathered and dried over a spring, summer, and fall. It was included as an article in The Essential Herbal Magazine during the first year. After adding just a few ingredients that didn't come from my yard, or woods, or the gardens of friends, the following winter was spent enjoying cups that never tasted the same way twice. It was a wonderful lesson in blending because not one cup was not enjoyable. I highly recommend it to new herbies. It will boost your confidence and teach you more than you'd imagine. Researching all the additions, tasting them, recognizing their flavors or even sometimes their effects; all these things are learned in this pleasant exercise. This technique is not for any specific medicinal value (obviously) but it can feel very symbolic drinking a cup while remembering finding a certain ingredient while hiking with a good friend, that perfectly sunny spring day when the violets were everywhere, or the beebalm bursting with blossoms under the hot summer sun. But I never had a specific list or pictures before. These ingredients are kept in separate containers (because nowadays they are used for lots of different things) until used in a blend. 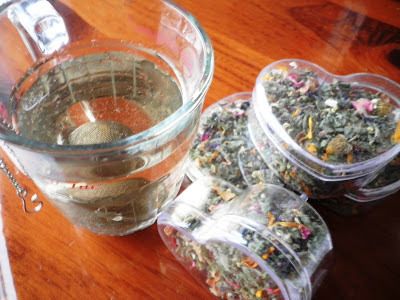 Today I set out to create a special tea for a project. The day was one of those where a bit of snow is on the ground with a wintry misty mix attempting to fight through the dense fog that rests between the rises of the earth. Gloomy. This calls for Spring flowers, fruits, mint and more. 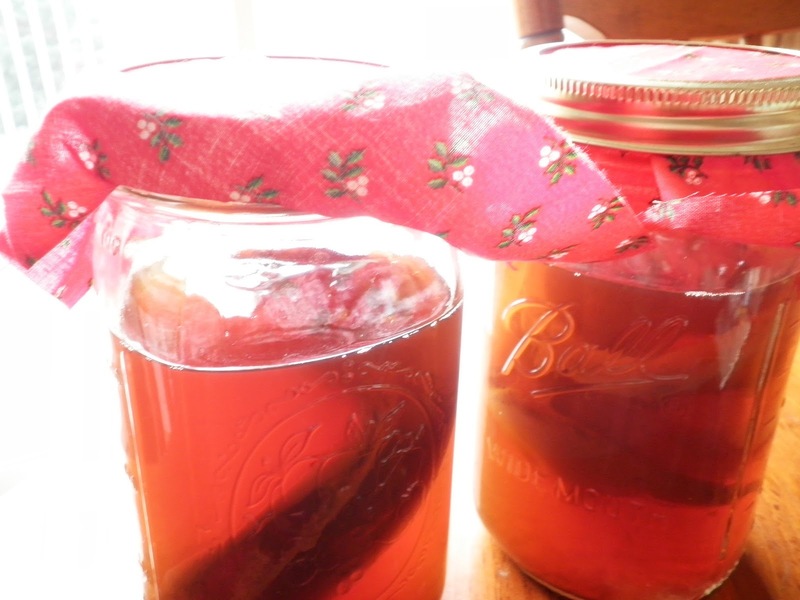 I will list the ingredients as I went along, and am proud to say that only a few were not hand-gathered and/or dried here in my kitchen and yard. 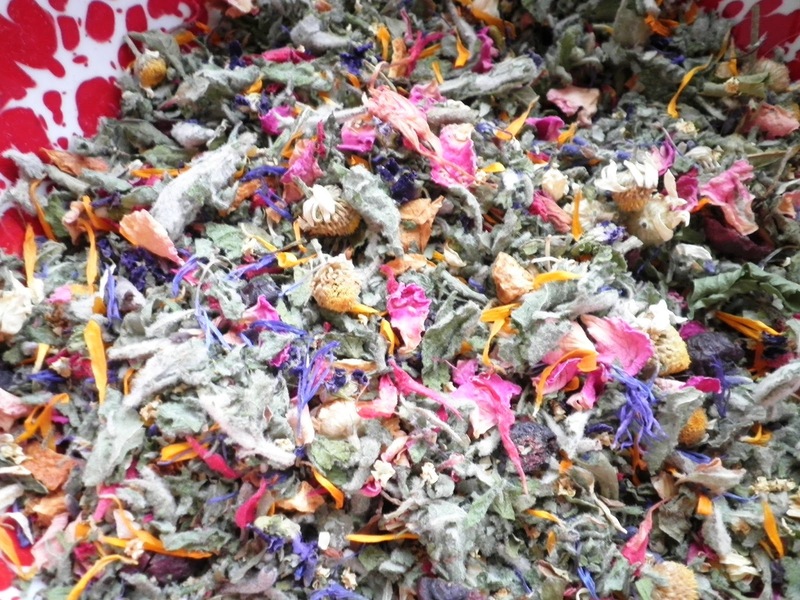 Whole violets, rose petals, lavender, elderblossom, chamomile, calendula petals, bee balm blossoms, and centauria petals. Pretty and fragrant. Next came the dried berries and fruits. Home-dried blueberries (chopped), raspberries, pineapple bits, orange peel, and let's add minced ginger to this category. To round it out, a couple handfuls of spearmint, a handful of lemon verbena, some holy basil, and a tiny amount of stevia. Two crushed geranium leaves for fragrance and it was time to try a cup. Nothing wrong with a pale cup, but in this case it needed more zing. Hmmm.... needs a little body. This is where the items that arrive here in bags come into the mix. A small amount of vanilla bean, cardamom seed, and cinnamon bark round it out perfectly. The tea darkened with further steeping. It tastes delicious. Sometimes it can require many tastes along the way before a cup tastes just right, so it is very important to keep a notepad nearby to record as you go. I was very tempted to add a little green or black tea, but refrained to keep it as much as my own ingredients as possible. And I'm pretty pleased with the results. Don't be afraid to blend up some herb teas. Just keep the quantity small, taste test as you go, and have fun. Two ingredients or twenty, it can be lots of fun. A month or so ago, my friend Jackie Johnson invited me to contribute to The Wisconson Herbalist (links to issues are at the extreme top of the page), a quarterly, free on-line magazine that she edits. I chose to write about loose incense, something I've not addressed for publication for many years. Getting my hands sticky with resins once again, it wasn't much of a jump for me to start dreaming up blends, even after the article had been sent and published. There is something so pleasing to the senses about the color, shape, weight, scent, translucence, and slight tackiness of the various resins. Irresistible lemony, smooth yellow orbs of copal look like they should be edible - and if they were, they should taste delicious. Same with frankincense - but neither of them would be. Shards of dragon's blood, still soft globs of pinon, rough and wildly varied in hue is the myrrh, and the powdery pale tan benzoin are all so unique and beautiful. Although herbalists often make salves with the pitch from various conifers while it is runny and sticky, I much prefer it in a more solid state in order that it can be blended into incenses. 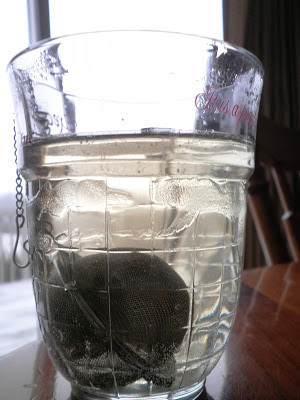 Last year I made a discovery that, although it requires patience, allows me to use all the small bits of pitch on the trees around me - even if it is gathered in a semi-liquid state. It seems that if gathered and placed in the deep freeze for a year, it will remain as hard little pebbles. Freeze-dried, I suppose. YAY! Local conifer saps are my favorites! LUNA- sweet yellow sandalwood and rose geranium balanced with benzoin, brightened with lemon verbena and cardamom. 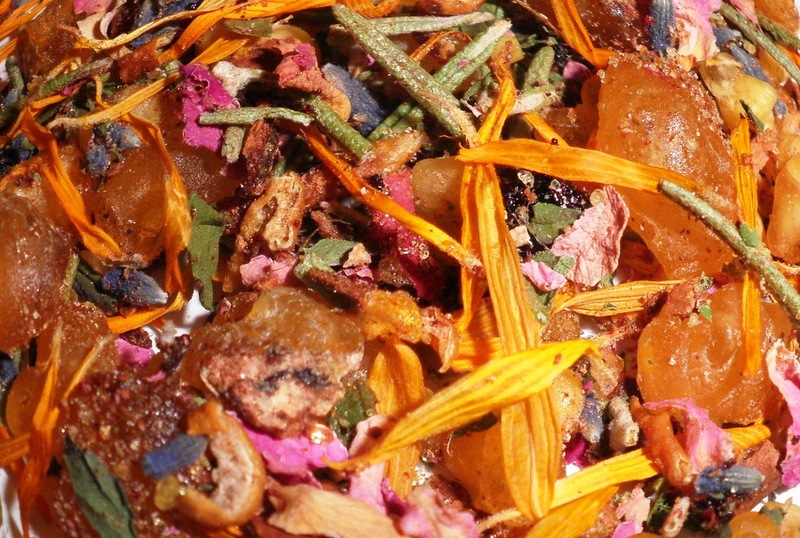 SUN GOD - a burst of summer from frankincense, cinnamon, orange, lavender, dragon's blood, sandalwood, etc. COME SEE ME - there's a story to this one. Many years ago we were invited to a hand-fasting and decided to make an oil for the couple. Looking through Scott Cunningham's book on incenses and brews, we found "Come See Me Oil" made simply with lots of patchouli oil and a bit of cinnamon in a carrier. It was a hit, and we later made a similar soap that we carried (along with the oil) at our renaissance festival shop. Now it is an incense, but with the addition of myrrh, rose petals, and violet flowers. It holds up well in incense too. WIDE OPEN SPACES - clean and clearing, this blend is of white sage, lavender, and copal. Perfect for clearing a mind filled with too many details. They are available and ready to go right now! Click HERE where you'll also find charcoal and burners. Lots of people don't like making resolutions. To them, it seems silly to choose one day to make changes. I feel differently about it. To pick one day means I have plenty of time to really ruminate on the intention, prepare in whatever way is necessary, and sort of re-set my mind. This year there were several. Two of them went hand in hand. One was to get back to the eating habits that were started last year and stuck for 6 months. The goal is to keep them longer, hopefully forever. Another was to spend less time on the computer, less time on social media, and the time that is spent on the computer will be working or writing. They are working very well together! Eating healthier foods mean that there is a bit more prep time - so automatically there is less time for sitting and scrolling. In turn, there is more energy. Good deal all around. 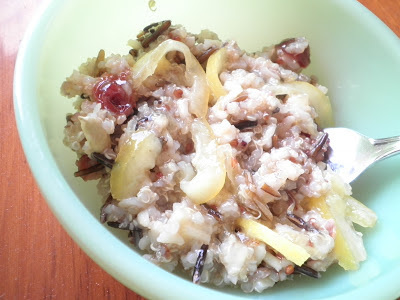 The eating plan involves no wheat (and limited grains), no high-fructose corn syrup and very little sugar, no processed foods - so while last year I had some breakfast cereal occasionally, that's off the table this year. I found a blend of amaranth, quinoa, and wild MN rice to which I've added pumpkin seeds, broken pecans, cranberries, and thinly sliced fermented lemons. This does NOT feel like a sacrifice! Cleaning out the fridge to make room for all the good fresh foods, resulted in finding not one, but 2 jars with kombucha scobies, so I'm attempting to revive them. 3 days in it isn't looking promising, but at least I'll know. Making a new one from a purchased jar of the beverage is a simple procedure, and the space in the fridge is freed up. Anyway, I got home with a large nearly-full market basket of many different colors of beautiful mushrooms. After weighing out the agreed upon amount and setting them aside, I got to work cleaning them. It was a little tedious, but interesting in that the mushrooms grow around stems and sticks that climb through them. The layers need to be separated so that any debris can be cleared. When they were all cleaned, they were snipped into thin strips and then went into a warm (set as low as possible - 120 f here) oven for a few hours to dry up the dampness. 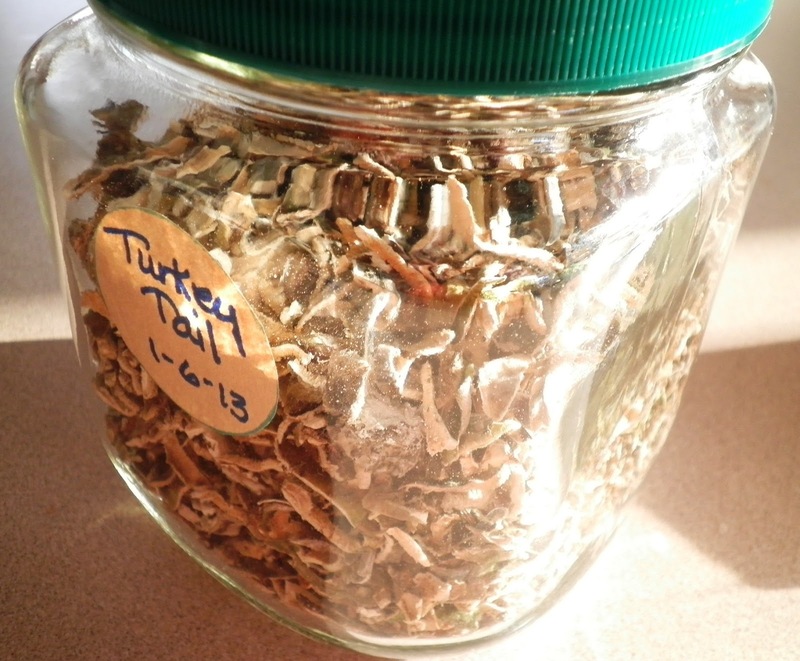 The processed mushrooms wound up being slightly less than a quart. Turkey tail mushrooms are used in some Asian countries for many cancers and studies have found it to be a wonderful anti-viral, great for immunity, and a valuable medicinal mushroom in many ways. Here is a good link that talks about some of the research. A great day walking in the woods, away from the computer, and then getting to work with the gathered mushrooms - it doesn't get much better than that. Towards nightfall, a very strong tea of the mushrooms was the reward. Thinking that it needs a little zip, though. Maybe a bit of elderberry and some ginger! So that's part of why I like resolutions. Change is fun. *Your magazine keeps getting better every issue! It makes my day when someone takes a moment in that impersonal space of a website order to drop us a line. We think this is the easiest way to let folks know exactly what we do here - by giving them a full sampling. 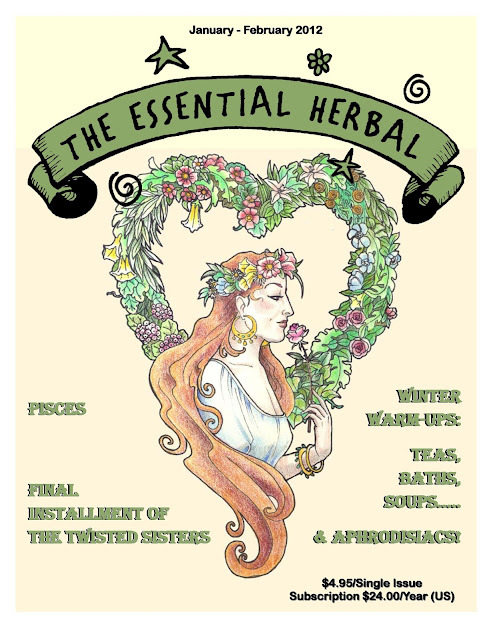 We've sent out The Essential Herbal's latest, Jan/Feb '13 issue, and have moved onto the Mar/Apr '13 issue, which will go to print by the end of the month.